Avicenna (ca. 980-1037|) - If you asked who was the greatest Greek philosopher in history, there would be much debate because of the great philosophers Greece produced. So it is with the question of who was the greatest Islamic philosopher as well. 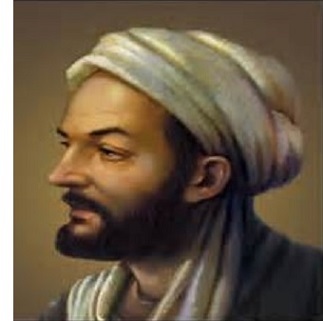 Al-Kindī is considered the "Father of Muslim philosophy" and al-Fārābī was called the "Second Teacher"; and yet Avicenna is often considered to be even greater than both of them. They were all polymaths, in that they studied multiple fields, but Avicenna was probably the most successful at the largest number of them. In addition to philosophy, he was particularly adept at medicine. Of his 450 works, 240 survive; 150 deal with philosophy, and 40 deal with medicine. Probably his two most famous works are the Book of Healing, which is an encyclopedic text, and the Canon of Medicine, which was required reading at many universities throughout the Middle Ages. The only source of information about his early years comes from his own autobiography which was written down by his student, al-Jūzjānī. Absent any additional information, it's impossible to verify how much of it is true. He was Persian born in the Samanid Empire. Supposedly, he had the Qur'an memorized by the age of ten. Unlike Al-Kindī and al-Fārābī, he did not study at the House of Wisdom. However, he was born near and studied in the Samanid capital of Bukhara (still capital of present-day Uzbekistan), which in Medieval times rivaled Baghdad in cultural significance in the world of Islam. Being from Central Asia, he was exposed to both Western and Eastern thought, studying intellectual predecessors from both regions. As a youngster he had trouble understanding Aristotle's Metaphysics until he turned to al-Fārābī who wrote a commentary on it. At 16 he began to study medicine, first reading existing texts, and shortly after practicing on patients. By 18 he was considered a fully qualified physician, and is often thought of as the heir to Hippocrates and Galen in the field of medicine. His writing career began at the age of 21, and one of his first works was the aforementioned Canon of Medicine. Other works include numerous commentaries on the ancient philosophers, including Aristotle who he had trouble understanding as a boy. In addition to philosophy and medicine, he also studied astronomy, alchemy, Islamic theology, mathematics, physics and poetry.